What can I say? Mega Man fans are a passionate bunch. There's nothing wrong with allowing your Blue Bomber affinity to spread to other parts of your life. The attention to detail here is all kinds of wonderful -- maybe even a little too wonderful. It's not a stretch to say this Mega-mobile is a perfect meta-commentary on distractive driving. Unfortunately, that's the only image we got on this lovely labor of love. Whoever owns this piece -- if you're reading this -- we'd love to see more! Amazing...I am stunned. Give me more photos!!!! Hehe, I have a list of battle chip names that I'd like to use as custom license plates. Oh hush. You should know by now when there's no news, TMMN and PRC tend to focus on cool stuff. 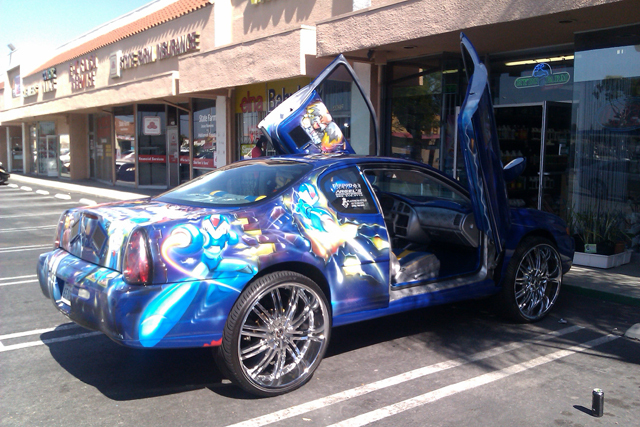 A megaman themed car needs more megaman? Now I want a Green Biker Dude motorcycle! @Hushing Anon: Hush yourself. You should know that a lack of news itself is kinda depressing as a rockman fan. While this is cool and all, this ain't the Touhou fandom - it's less the extra stuff and more the actual games that get people excited. I'm no exception. The stuff is cool and all, but... it doesn't get my blood pumping. It doesn't really excite me. How often do we get to see a Mega Man-themed car ANYWHERE, not to mention it is adorned with Mega Man X art as well? For X fans like me, that's a pic worth a thousand words! Okay... so it's not news about any upcoming Mega Man games... there won't be for a long while. But in the meanwhile, it's great to see other people showing their love and support for the franchise in mind-blowingly cool ways like THIS! Imagine driving to work or classes every day... in THAT car...! looks like a late 90s early 00s Chevy Impala.